You've never seen the lake like this before. Inland Lakes Vision – West provides highly detailed maps of inland lakes, rivers and waterways. 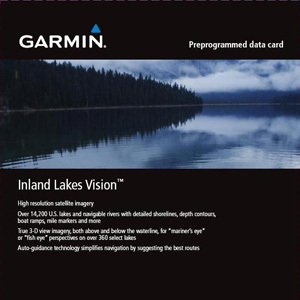 By plugging an Inland Lakes Vision microSD/SD card into your compatible chartplotter, you'll see shoreline, depth contours, bottom conditions, boat ramps, mile markers and more. View lakes in even richer detail with high-resolution satellite imagery and 3-D surroundings, both above and below waterline, for "mariner's eye" and "fish eye" perspectives on the most popular lakes. Plus, get auto-guidance technology which simplifies navigation by suggesting the best routes. Maps also include wrecks and obstructions, river and creek channels, and major roads and highways. 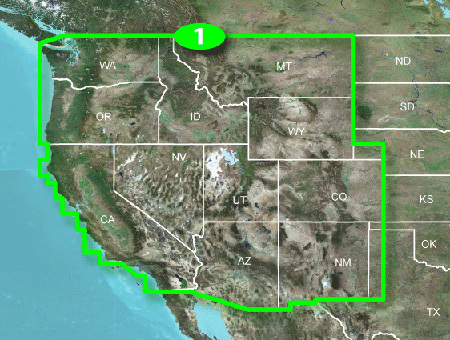 Coverage includes freshwater lakes in Arizona, California, Colorado, Idaho, Montana, Nevada, New Mexico, Oregon, Utah, Washington and Wyoming. Contains coverage of freshwater lakes in Arizona, California, Colorado, Idaho, Montana, Nevada, New Mexico, Oregon, Utah, Washington, and Wyoming. Also includes full coverage for specific lakes where lake detail extends into neighboring states. Provides even richer detail for many popular lakes. Includes high resolution satellite imagery for selected lakes, which provides the mariner with unparalleled situational awareness. Provides Mariner's Eye View for selected lakes, which shows your surroundings in 3-D so you can gauge your position quickly and reliably. Provides Fish Eye View for selected lakes, which shows your surroundings below the waterline in 3-D, including bathymetric detail. Includes Auto Guidance for selected lakes, which searches map data to suggest the best passage to a destination. Includes rivers, streams and river and creek channels. Allows you to search by lake or by city. Includes interstates, highways, and general roads. Please verify whether this map is compatible with your Garmin device. To view and use the maps on this card, you must have a Garmin device with a microSD or SD card slot. Maps on microSD/SD cards cannot be copied or viewed on a computer. Includes freshwater lakes in Arizona, California, Colorado, Idaho, Montana, Nevada, New Mexico, Oregon, Utah, Washington, and Wyoming. Also includes full coverage for specific lakes where lake detail extends into neighboring states.